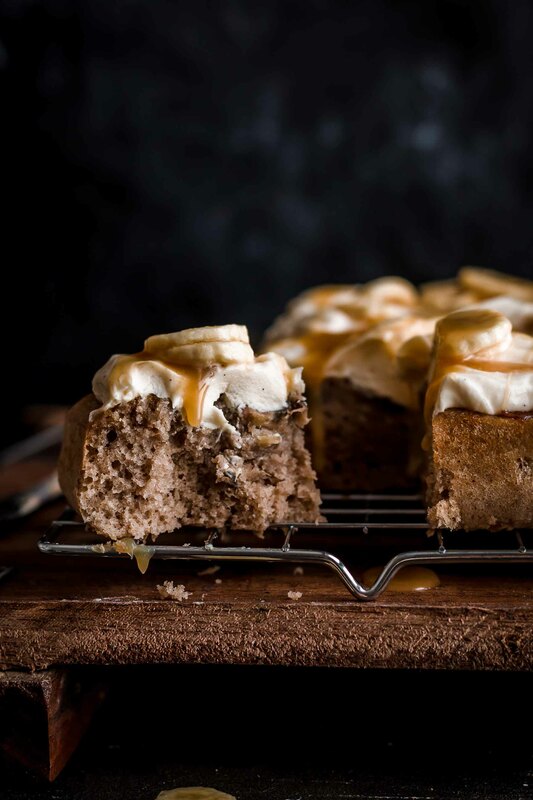 This Banoffee Cake is a dreamy combination of banana cake and salted caramel cream cheese frosting. 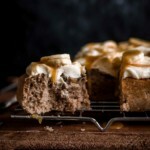 The banana cake is super moist and soft and is meant for the ultra creamy salted caramel cream cheese frosting. Strong banana and caramel flavors. Completely made from scratch. Even the caramel sauce. Detailed step-by-step instructions including lots of photos and video provided. 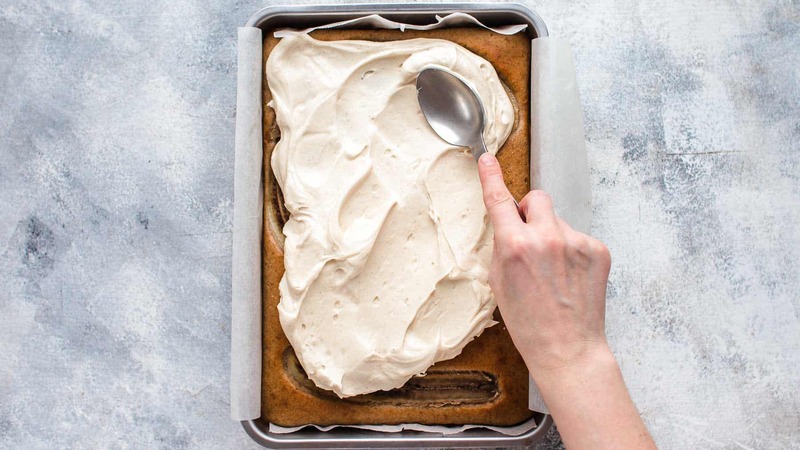 If you make this Banoffee Cake, you don’t need to be scared that the cake falls apart when you poke into it with a fork. The cake has a very soft but dense crumb. I topped my banana cake with halved banana slices, but this is optional even though highly recommended. But add sliced bananas just in case when you don’t freeze leftovers and plan to finish the cake within two days. The cake itself is pretty straightforward to make. The frosting too. The trickiest part can be the homemade caramel sauce, but when following the detailed instructions below you will master this one as well. Plus I give you some tips, how to save your caramel. Just in case you overcooked it. Making homemade caramel sauce is literally just one step. Bring all ingredients in a heavy-bottomed saucepan to a simmer and cook over medium-low heat for 5-10 minutes. 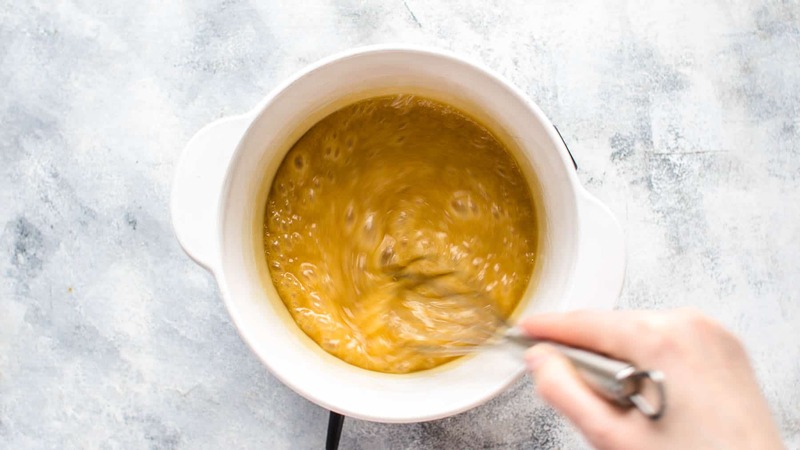 The ingredients you need for the caramel are butter, heavy cream, brown sugar, salt, and honey. If the caramel splatters while cooking, you may want to wear kitchen gloves for protection. Cook caramel until it coats the back of a spoon and has thickened up. Remove from heat and let cool to room temperature. It will thicken as it cools. If you notice that the butter separates from the caramel sauce, don’t panic. It’s a high chance to save it. I found here an excellent article on what to do if your caramel splits. If this happens to me (yes, it happened to me multiple times in my baking life!) I whisk vigorously and look if it incorporates again. If this doesn’t help, I add 1-2 tbsp of boiling water and stir until it’s smooth and combined. Also if you accidentally added too much water and the caramel sauce is now too liquid, bring it back to a simmer for 1-2 minutes until it thickens up again. 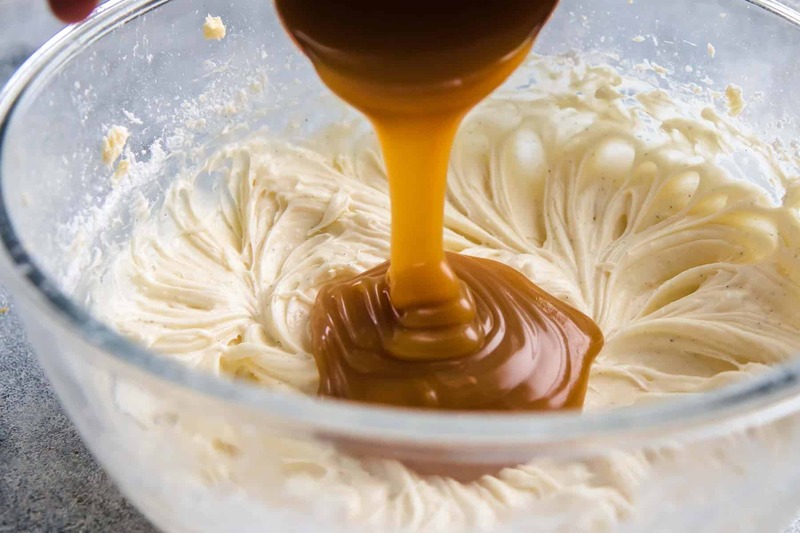 Remove 1/2 cup of caramel sauce for the frosting after cooking. The rest of the caramel is for drizzling over the cake before serving. If the caramel sauce is too liquid after it cooled down to room temperature you can reheat it for a couple of minutes. Watch the video and also the photos below to see how the caramel sauce looks like once it’s cooled. Now it gets super easy. You need just 1 bowl and a couple of minutes to make the banana cake. Start with mixing eggs, brown sugar, oil, and mashed bananas in a large bowl just until combined. 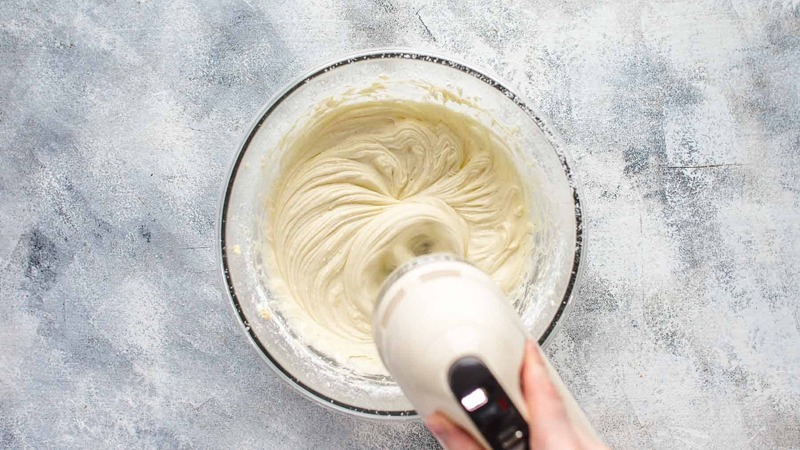 Use a large mixing bowl and a handheld or stand mixer fitted with a paddle or whisk attachment. Then add flour, baking powder, salt, and cinnamon and stir to combine. The batter will be very creamy. 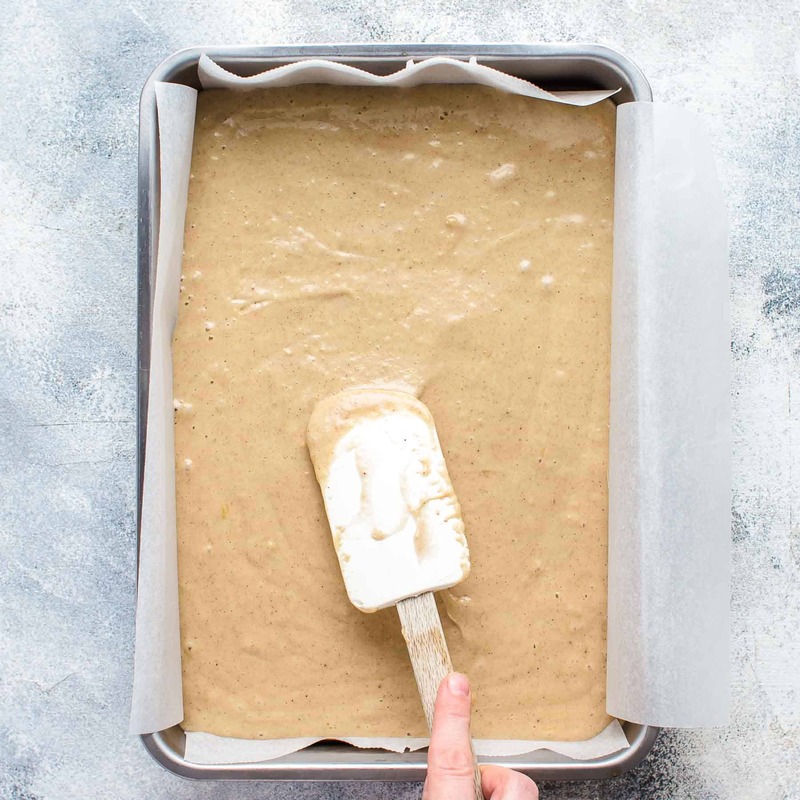 Transfer to a parchment paper layered 9×13″ baking pan. Spread batter evenly and top with halved bananas if desired. Bake for about 40-50 minutes until a toothpick inserted in the center comes out clean. Cover loosely with parchment paper or aluminum foil after 25-30 minutes if the top browns too much. Let cool completely before you top it with frosting. The frosting requires about 5 minutes of mixing time, and you need just one large mixing bowl. 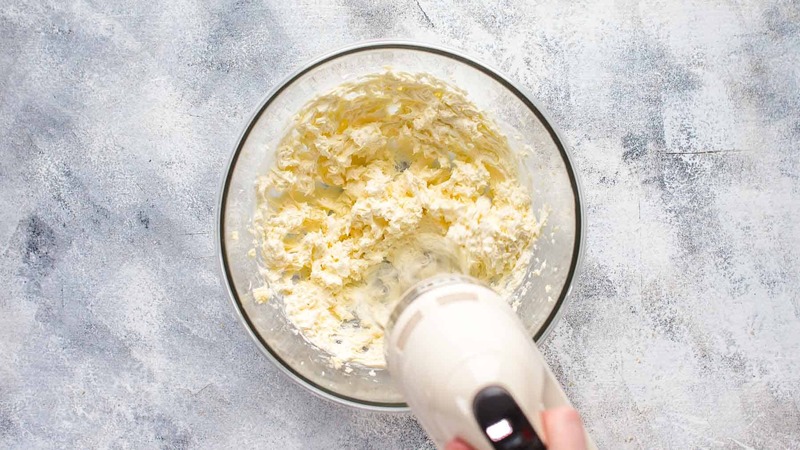 Start with mixing the butter until it’s smooth and creamy. 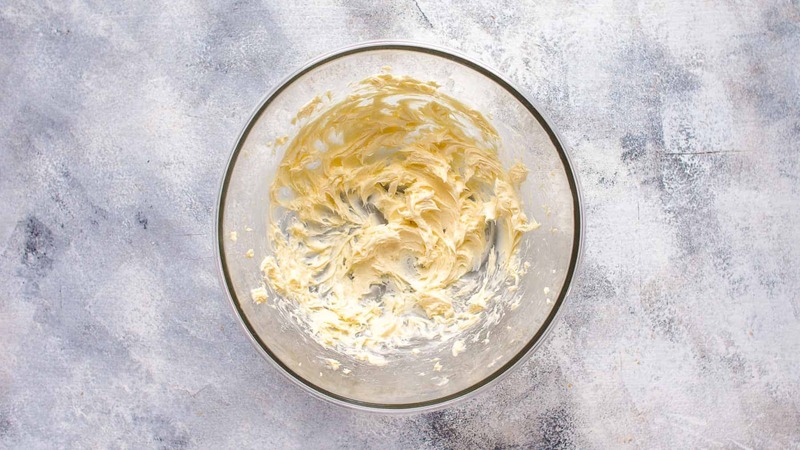 Use room temperature butter for best mixing results. Mix about 1-2 minutes. Then add the cream cheese and mix until evenly combined. You can use brick style or spreadable Philadelphia cream cheese. The recipe works either way. If using brick style cream cheese, I recommend to let it come to room temperature before combining it with the butter. Spreadable cream cheese can be used straight out of the fridge because it’s already soft out of the container. Add sifted powdered sugar and vanilla and stir until smooth and creamy. Then add homemade salted caramel sauce. In the picture below you can see which consistency the caramel sauce should have when it’s cooled. Then spread salted caramel cream cheese frosting on top of the cooled banana cake and let cool for 1 hour before serving. Top with fresh banana slices and drizzle with remaining caramel sauce. For small batch version, divide the recipe in half and bake the banana cake in a 9″ (23cm) baking pan for 25-28 minutes. I recommend storing it in an airtight container in the fridge. This depends on how you made the cake and how you store it. If you didn’t top the cake with halved bananas, it would last up to 3 days in the fridge. If your banana cake has sliced bananas on top, it will stay fresh for 2 days. Also if you don’t frost the whole cake and store the cake and frosting separately and spread it just before serving on top, you can store it an additional 2 days longer in the fridge. Reason for the differences is that the sliced bananas on top lose its moisture over time and make the cake wet over time. The same is true for the frosting. It also loses water over time, and the cake gets wetter the longer it is stored. You can prepare the caramel sauce and also the banana cake up to 2 days in advance. In this case, please skip the halved bananas on top. Store both in the fridge until you make the frosting and assemble the cake. Maybe you need to reheat the caramel for the drizzle to reach the desired consistency. The cake will last 2 more days in the fridge. If you plan to freeze the banana cake, please bake it without the halved banana slices on top. After baking the banana cake, let it cool completely. Then tightly wrap in plastic foil twice. Then wrap two layers of aluminum foil around. Freeze up to 2 months. For thawing, unwrap the banana cake and let sit on the counter for about 2-3 hours. Once it is room temperature, make the frosting and assemble the cake as described. For gluten-free banana cake, I recommend using Bob’s Red Mill Gluten Free 1:1. That’s the only substitution I recommend without changing main parts of the recipe. 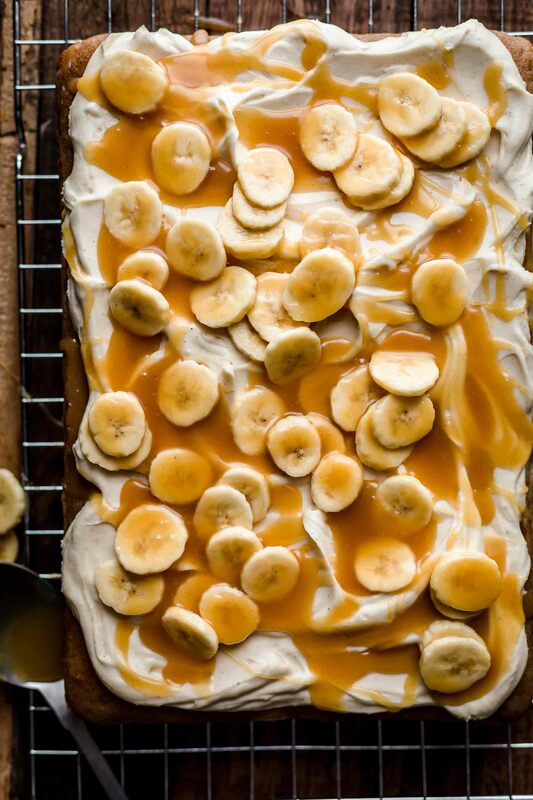 If you make this Banoffee Cake recipe leave a comment, rate it and tag a photo #alsothecrumbsplease on Instagram! Would love to see your snap! 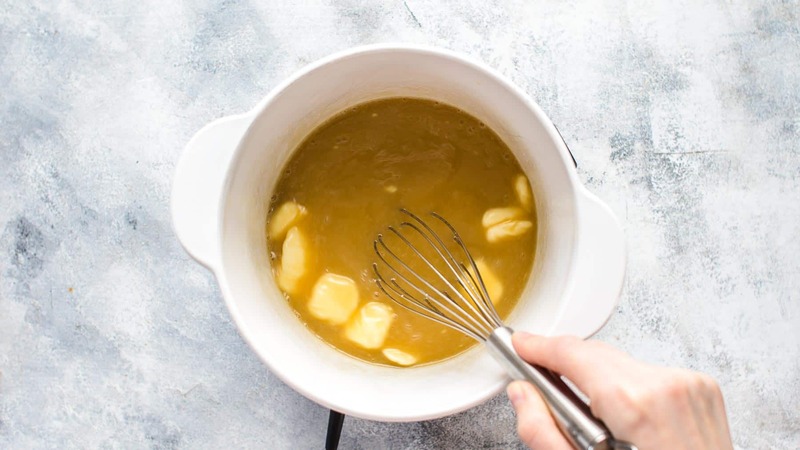 In a heavy-bottomed saucepan, combine butter, heavy cream, brown sugar, salt, and honey and bring over medium heat to a simmer. Whisking continuously, cook for about 5-10 minutes until it has thickened up and coats the back of a spoon but is still liquid. Remove saucepan from the heat. The caramel will thicken as it cools. 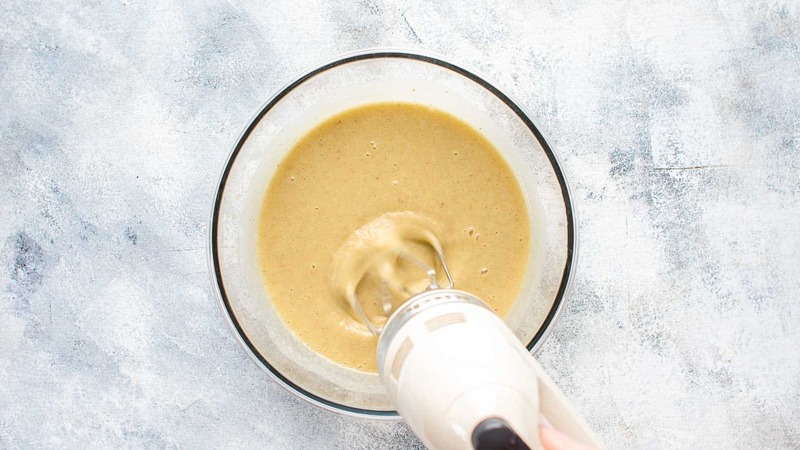 With a heatproof cup scoop out 1/2 cup (160g) of caramel sauce and transfer to a small bowl and let cool to room temperature (you need this for the cream cheese frosting later). Let the rest of the caramel sauce cool to room temperature until your cake is ready for serving. Preheat oven to 350°F (175°C). Line 9x13" (23x33cm) baking pan with parchment paper. Set aside. 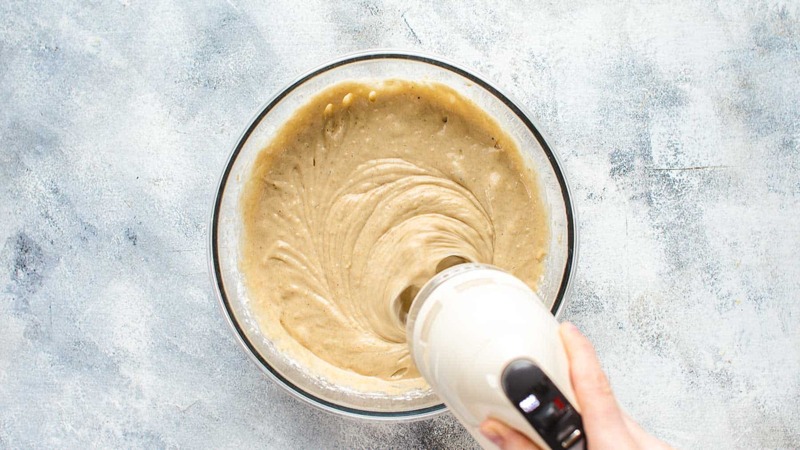 In a large mixing bowl, using a handheld or stand mixer fitted with a paddle attachment, stir eggs, brown sugar, oil, and mashed bananas on medium speed until smooth and well combined for about 1-2 minutes. Stir in flour, baking powder, salt, and cinnamon just to combine. Pour the batter into the prepared pan and spread evenly. Top with halved banana slices if desired. Bake for about 40-50 minutes or until a toothpick centered in the middle comes out clean. Cover after 25-30 minutes with parchment paper or aluminum foil if the top browns too quickly. Remove from oven and let cool to room temperature. 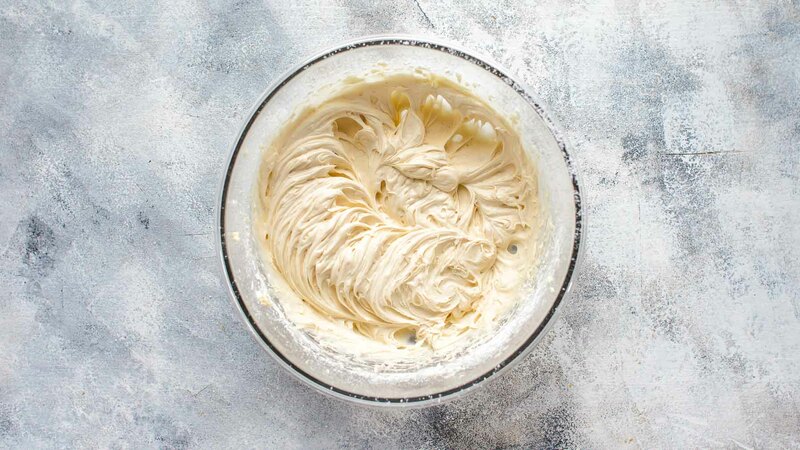 In a large mixing bowl, using a handheld or stand mixer fitted with a paddle attachment, whisk butter until very creamy, for about 1-2 minutes. Add cream cheese and mix until well combined and smooth. 1-2 minutes. Stir in powdered sugar and vanilla* and mix until creamy about 1-2 minutes. Add 1/2 cup of the homemade salted caramel sauce and mix until creamy and smooth for another 1-2 minutes. Spread salted cream cheese frosting on top of the cooled banana cake. Refrigerate for 1 hour. Top with additional fresh banana slices (if desired) and drizzle with remaining caramel sauce before serving. Store in an airtight container in the fridge up to 3 days. 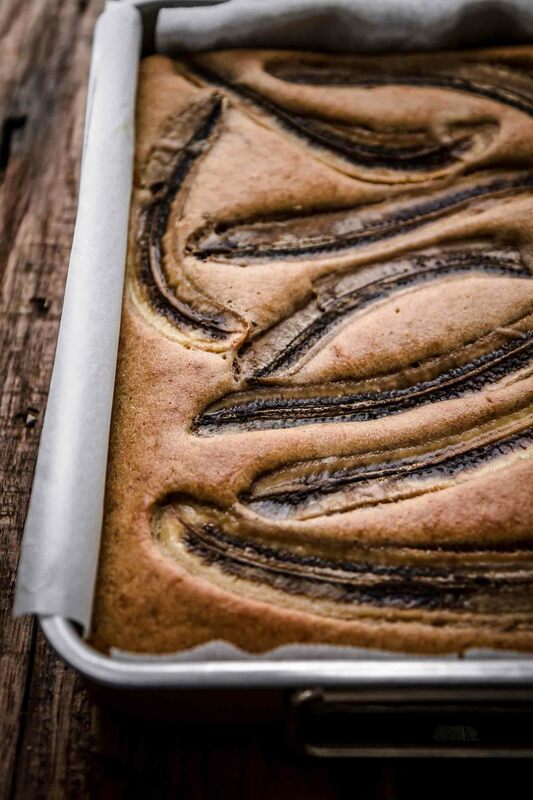 For small batch version, divide the recipe in half and bake banana cake in a 9" (23cm) baking pan for 25-28 minutes. 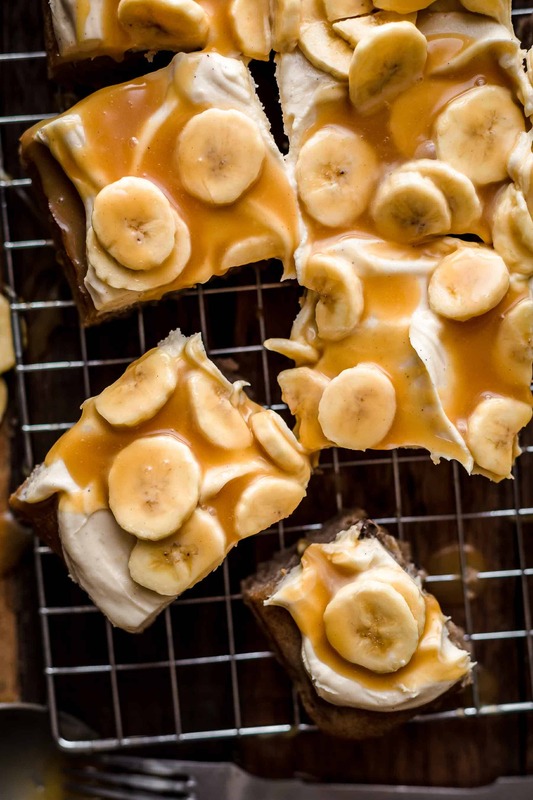 Read the blog post for additional information on how to make, store, freeze Banoffee Cake, and also what to do if your caramel splits. Watch the 67-seconds video to see the whole process of making the cake. Love the cake. The salted caramel sauce was a hit. ( it would be great on ice cream. I probably used 7 bananas total. Love the detailed recipe notes. This was very easy to make. Thank you so much for your feedback, Lori! I’m happy that you like it. And I agree with the caramel sauce as an ice cream topping.